I'm counting down the day's to April 1st which is my first official start date as a DT Spring Gardner for . I can't wait to show you some great creations using these stamps. I've had a long weekend spent out of the city and I feel refreshed and ready to go. I had a great visit out on the farm. Lot's of cow's, deer, baby barn kittens and LOTS of quiet! It's so nice to have a place to go to clear the mind. For today I wanted to do a quick card from Forest Friends. This is so adorable! I love that you colored the deer pink, too cute! I also love the flower with the brad in the center. TFS! Aww, cute in pink! 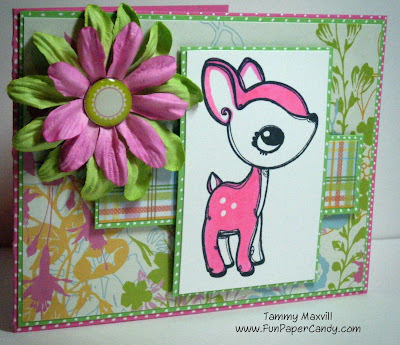 Love all the polka dots and the pretty flower with it, adorable card! how cute!!! love seeing the deer in pink! Adorable! I love the pink deer. I would not have thought about coloring it pink but I love it. I hope you had a wonderful weekend! Hugs! Ohhh my cutest "pink" deer, I love it, I never thought to color it in different color, brillant!!!! And the dp and flowers, it matches perfectly!